“If you want to be a different fish, you’ve got to jump out of the school”. Don Van Vliet, better known as Captain Beefheart said this about his lack of a formal education during an interview on Late Night with David Letterman. 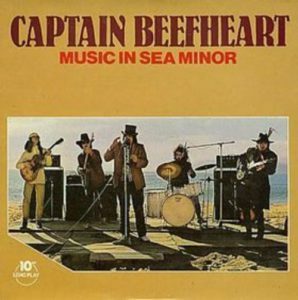 Captain Beefheart was a different fish. As a child he was a prodigy with sculpture, earning accolades and invitations to study sculpture in Europe. His parents refused him the opportunity to study abroad, worrying that pursuing art would alienate their son. His was response was to lock himself in his room to listen to rhythm and blues records with his friend Frank Zappa. This friendship would continue into adulthood when the two collaborated on several different projects, including the live album Bongo Fury. Zappa would also produce and record Beefheart’s magnum opus, Trout Mask Replica. The record is a 10″ 33 1/3 RPM long play, which is an unusual size and speed combination. The cover of the record is a promotional photo taken during a concert on the beach in Cannes, yet the album does not feature live audio from the concert. The album itself is a compilation of six tracks from Safe as Milk and two from Mirror Man. The record was pressed in the United Kingdom in 1983 by Precision Records & Tapes. It was released a year after what would become Captain Beefheart’s final album, 1982′ s Ice Cream for Crow. 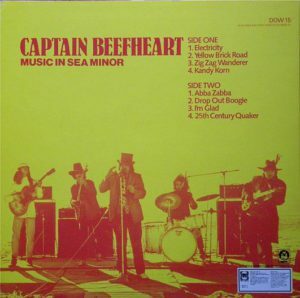 If you are looking to get into early Captain Beefheart and do not want to spend upwards of $100 on a record, this album is worth the $15-$20 price tag it carries with it today.